The guest rooms at the Saint Georges Hotel occupy floors 9 to 14 of the building. All have great views of London, regardless of which direction they face. All of the rooms are very well appointed, en-suite, air-conditioned and amenities include satellite flat screen TV, free wireless internet access, mini-bar, safe, desk, ironing facilities, hairdryer, tea/coffee making facilities, direct dial phone with and voice mail. Bedrooms have large windows. Some rooms have a trouser press. Executive rooms are on 2 dedicated floors and are all contemporary with enhanced refreshment tray, upgraded toiletries, bathrobes and slippers. There are 8 hotel suites. The Heights Restaurant, Bar and Lounge on the fifteenth floor offers stunning views of London thanks to the "Wall of Windows". Here the setting is one of airy and light with a stylish feel. The restaurant serves contemporary European and International dishes. Serves breakfast (continental and full English), lunch and A La Carte evening meals. Extensive wine list available. Wine by the glass with beer is an option. The bar and lounge serves light meals, tapas and sandwiches along with the drinks. Also serves afternoon tea. The Saint Georges hotel features meeting rooms and function rooms and holds a wedding licence. Concessionary rates with nearby LA Fitness Centre available via hotel. Nearest: Tube Station: Oxford Circus 334 yards (305 metres), Railway Station: London Euston 0.8 miles (1.3 km), DLR Station: Tower Gateway 3 miles (4.8 km), Motorway: M1 Junction 1 5.3 miles (8.5 km). 5 tube (underground) stations within a half mile circle (0.8 km) , makes this a great choice for transport links. Centrally located by Oxford Circus (cross section of Oxford Street and Regent Street) is the Saint Georges Hotel London. Bang on the doorstep of one of the busiest and best shopping areas in the capital. Oxford Street is a long road of large stores and smaller boutiques with many shops geared toward the tourist while Regent Street is home to some world famous stores such as Hamlets for toys and Liberty's for fashion. A short walk to the North is Regents Park, one of the largest and most popular London parks and home to London Zoo. Other nearby attractions include Trocadero Centre, Madame Taussauds, Trafalgar square, St James Palace, Pollocks Toy Museum, Wallace Collection and British Museum. The Saint Georges overlooks the All Souls Church and is situated close to the BBC Broadcasting House, at the top of Regent Street. Compared to other London hotels: This hotel has been rated 73% by past guests. The London average is 80% and the average for 4 star hotels is 83%. Therefore this hotel is below average for its sector (star rating) . Milesfaster ranking: 685th from 866 London hotels, and 297th of 328 four star rated hotels. Looking for lower base rates? Then another option might be the Chamberlain Hotel. 0.1 miles from here (0.2 km), achieving a rating of 91% by its past clients where rates start from approximately £87 (theres free WiFi too). 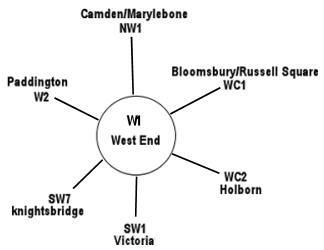 The fifty hotels that are closest to this location (14-15 Langham Place, W1 postcode) which we list extend for a 0.6 miles (1.0 km) radius. They are made up of 19 five star hotels (average rating 87%), 23 four star hotels (average rating 82%), 6 three star hotels (average rating 80%) and 2 two star hotels (average rating 66%). Top 4 star hotel is The Nadler Soho at 96%. Top rated of the local hotels are Soho Hotel (5 star) and also The Beaumont London (5 star) (both joint top with 99%). Base Rates: Base rates can indicate the lowest available rates for a particular hotel. This is a good general guide but as base rates do not account for special offers and one off deals they can only be a rough guide. The average base rate for all the areas hotels is £194 per night. From a low of £18 at SoHostel (2 Star, 80%) and the highest rates top out at £475 at Rocco Forte Brown's Hotel (5 Star, 90%). The following are the averages for each star level: Five Star average: £313, Four Star average: £137, Three Star average: £88 and Two Star average: £36. Using our in-house algorithm we rank hotels based on guest ratings and weighted for related factors we rank Saint Georges Hotel 45th (joint) of 50 area hotels and 21st (joint) for the 23 four star hotels in the area. We rank the hotel 16th of 50 (8th of 23 four star hotels.) for base rates. We rank this hotel based on rates and also review scores to place it 39th of 48 of all the closest hotels in terms of value for money (SoHostel was top).